Golf is one of the most popular sports to bet on, due to the high-valued prices on offer from bookmakers. It’s never been easier to place an online golf bet and now most tournaments around the world are open for the public to bet on. From the PGA Tour to the LPGA Tour and everything in between, there is money to be made betting on golf where our recommended bookmakers offer the very best in both odds and betting options. Bettors must correctly predict the winner of the selected tournament. The most popular option for punters, due to the value odds on offer, Tournament Winner bets attract not only big punters, but those in the hopes that a $5 outlay can turn into thousands. In a typical tournament, the favourite – depending on skill level – will be set around +900 to +1100. At the other end of the scale, players that are not fancied to win the tournament can pay anywhere in the realm of +99900. Bettors often like to select more than one golfer per tournament, to ensure they have a better chance at making a profit in the long run. Obviously, both golfers can’t win, but when the odds are so highly in your favour, it pays to cover the bases. This is much like the Tournament Winner bet, except it covers any of the first five places (and ties) at reduced odds. The standard rule of thumb is a 25 per cent deduction on a golfer’s outright odds. For example: Tiger Woods is +1900 to win the US Open. His Top Five odds would be around +400, 25 per cent of his opening price. Punters enjoy the top five option as it gives them added security and it also gives them the freedom to throw a couple of longshots in the mix as well. Select who you think will hold the lead at the end of the first round. This option appeals to punters who want a quick collect, as all bookmakers pay out First Round Leader bets at the day’s conclusion. There are certain world golfers who play best in round one, therefore they are usually well favoured despite their overall tournament odds. These include Hunter Mahan, Justin Rose, Martin Kaymer, Rory McIlroy and Sergio Garcia, just to name a few. The odds for First Round Leader are often higher than those set for Tournament Winner. This is down to the probability of ties, which do not occur in the outright market. If a player’s tournament odds were +1100, their first round odds might sit around the +1400 mark. As the name would suggest, players must finish in the top 10 or 20 depending on the market you choose. If a player is paying around +1200 to win the tournament, the odds for Top 10 would be around +170 – significantly less than the tournament winner price, but with a much higher likelihood of success. Often the well-favoured players consistently make top 10’s and 20’s, so the shorter odds available make for good parlaying (multi-bet) options. For a Top 20 bet, expect a full point ($1) to come off the Top 10 price. This option is widely considered the easiest bet in golf. Bettors select players to simply make or miss the halfway cut. With most tournaments having full fields that are reduced from 120 to 70 players after the first two rounds, it makes for a relatively easy option at modest odds. Not every player is available in thee markets, however. Odds for Rory McIlroy to make the cut, for instance, would sit at -1000 or less, and that doesn’t appeal to punters who are used to betting at bigger odds. Instead, online bookmakers offer players who will likely be nearer the cut line. Even so, most of these players will range from -500 to -200 to make the cut, and +200 to +400 to miss the cut. Group betting is where you select a player to have the best score against the other players in his group for any given round, or for the entire 72-holes. If you decided to bet on Tiger Woods, he would have to beat both McIlroy and Day in the first round. In the event of a tie, payout deductions occur. A common strategy is to back two players from any given group – so if you backed both McIlroy and Day, for instance, you would make a profit if either of those two top the group. Group betting is so popular because the markets and odds differ from day to day. Groups change after each round and at every tournament, so the handicapping process is never the same. Head-to-heads are where the bookmakers set featured pairings at the start of a tournament. Punters must decide which of the two will beat the other over 72 holes. If one player makes the cut and the other misses, the money is paid out right away. The beauty of these markets is that the two players don’t have to be grouped together on the golf course. That means bookies can set up fantasy matchups for the best players in the world, thus attracting significant action from casual gamblers and golf nutters alike. This option is a little bit of fun that always involves the best players in the world. The ‘Big Guns’ are the top handful of players in the outright betting, while ‘The Field’ covers every other competitor in the tournament. This is an especially popular bet during the majors, when the cream of world golf is expected to rise to the top. While the true odds of any golfer scoring hole-in-one stand at around 12,500/1, bookies pay significantly less than that for aces in professional tournaments. Prices are shorter still at venue where the par-three holes are designed to encourage aggressive strokeplay – like in the Humana Challenge, for which bookmakers have been known to offer +150 for a hole-in-one and an incredible -200 for no hole-in-one. Those are common odds for this type of wager. Playoffs are not all too common in the majors, but they happen quite frequently on both the European Tour and the PGA Tour. Because the fields are so even, the probability of a playoff increases as the likelihood of a runaway winner lessens. Live betting in golf can be a fine art. Most professional gamblers like to take a handful of golfers pre-tournament and then bet live on other golfers throughout the tournament to ensure they make a profit. Let’s say you select five golfers at $10 a piece. Your expected return if any of your five golfers wins is roughly $200. As the tournament progresses, you can track the results of your picks and make additional bets to give yourself the best possible chance of securing a profit. For example: two of your five players are situated in the top five after the third round. A popular move in this scenario is to place bets on the other three players in contention, but only enough to ensure you come out ahead no matter who wins. This is called golf management and whilst it takes away the ‘big win’ feeling, it is a good way to make money through the live betting option. Men’s golf has four major tournaments played in the calendar year: the US Masters, US Open, Open Championship and PGA Championship. Together they form the Grand Slam – a feat few players have achieved in a career, let alone in a single year. 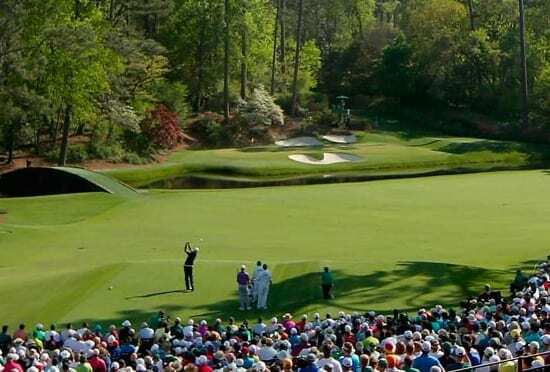 The Masters Tournament is held in April each year at the exclusive Augusta National Golf Club. Founded by the great Bobby Jones in 1934, it is both the newest and the most glamorous of golf’s majors. The course is renowned for both its beauty and its difficulty. Flawless fairways are interrupted by blinding white bunkers and numerous water features, while lightning-fast putting surfaces quickly rule out anybody whose short game is out of whack. The world’s top 50 players earn an automatic invitation to the Masters, as do all past winners. The rest of the field is filled out with national qualifiers and leading amateurs. Besides a handy sum of just under US $2 million, the winner is also awarded the coveted green jacket – now one of the most recognised prizes in all of sport. Establish in 1895, the United States Open Championship has long ranked as the most fiercely contested golf tournament in North America. The field is made up of 156 players, including amateurs, and recent winners have included Germany’s Martin Kaymer, England’s Justin Rose, and Northern Ireland’s Graeme McDowell and Rory McIlroy. The US Open is played in June, some two months after the conclusion of the Masters. The venue changes from year to year, encompassing several modern designs as well as several American classics. Courses that have hosted multiple US Opens include Oakmont, Merion, Winged Foot, Shinnecock Hills, Pinehurst, Olympic Club and Pebble Beach. The location may move around, but one thing remains constant: the playing conditions are as penal and unforgiving as any tournament on tour. With only a few exceptions, such as Brooks Koepka’s record win at Erin Hills in 2017, it is rare for multiple players – if any – to finish under the card. Held in the United Kingdom, the Open Championship boasts the biggest field of all four majors and has the tagline “Toughest major in the world”. The ‘British Open’ is the oldest major where players compete for the Claret Jug. First run in 1860, the Open Championship is one of the oldest competitions in the world and is usually dictated by the wild weather of the U.K. The odds are influenced by both the Masters and the U.S. Open, therefore the market usually comes out in June – however some bookmakers have all major markets open all year, and the Open Championship is played in July. The final major of the season is run by the Professional Golfers’ Association of America and takes place at a different course each year. It is usually played in August and offers a big purse of US$10 million, which makes it the richest of the four majors. Although not as glamorous as the Masters, not as old as British Open and not as brutal as the US Open, the USPGA regularly boasts the strongest field of all the majors. That’s because it is the only one that does not reserve places for amateurs, so most years all 156 slots are taken by successful tour players and leading club pros. The PGA honour board is littered with big names. Walter Hagen and Jack Nicklaus each won it five times, while Tiger Woods has lifted the Wanamaker Trophy on four occasions. The PGA Tour is the global gold standard for men’s professional golf. Featuring the best players from the United States and all over the world, it runs year-round from the Safeway Open in October to the season-ending Tour Championship the following September.